Sorry I've been so busy! It was my birthday on Thursday ( The big 2.1!) and I basically have milked for all it's worth! I've also been arranging my NY transfer so I've been busybusybusy! I also still don't have a camera! So I'm off to Tottenham Court Road to try and haggle for a 12mp Sony. A FOTD and a big haul will be coming veryvery soon! It got me thinking,that alot of the stuff that consumers buy-we are paying for the name sewn onto the label rather than the time and skill that has gone into creating the garment.Which is why alot of the time a waistcoat you buy for 30 quid falls to bits 2 days later (cough H&M cough). I made a batch of emo-ish polkadot bow headbands and clips for my little sister the other day and have decided to move onto something more ambitious! 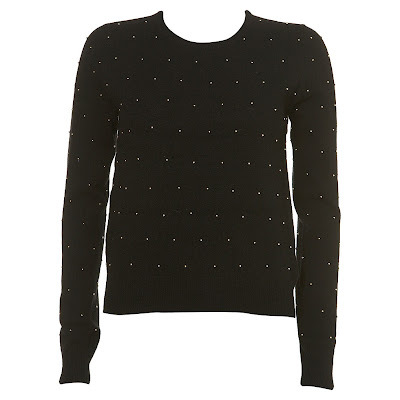 I have a cheapo black jumper from Primarni,some invisible thread and a packet of 200 mini gold beads from John Lewis. Wish me luck! Do any of you,DIY? I want some inspiration! p.s: Is anyone else watching The Rachel Zoe Project? I'm obsessed! So last Friday was PAYYDDAAYYYYY! woo! SO needless to say I went shopping! And managed to control myself! I'm so proud of myself! I had my eye on these H&M boots for a few weeks. I've been "blessed" short and stubby legs so have decided to try and wear more heels to stop me from looking like a squat little blahhhh! I love them because they have a nice chunky heel so although they are pretty high (for me!) they should be easier to walk in.Another reason I loved them was because they are lace ups which are hothothot for autumn/winter '09/10 and the peep toe just sold me completely! So... I wore them out on Friday night with jeggings and a baggy t-shirt and got LOADDSSSS of compliments until... my feet started to bleed! Yeah they look hot but they hurt my toes like a mofo! Next time I'll take some plasters and ibuprofen before I wear them! I also picked up this "Rebel without a cause" tee from Hennes too. I know James Dean died wayyy before most of us were born,but he was a hottie,non? Then I hit Marble Arch Primark. ( it was early,thank god. That place turns into a zoo past 12 o'clock!) And I got this zebra print bracelet. I also got a plain set of gold and silver bangles too but they aren't coming out very well on camera. Last stop was Boots! I got the L'oreal Studio Secrets Primer after I tried the sample in last months Elle magazine and was majorly impressed. It makes your make-up go on silky smooth and really irons out any pores or lines you ma have on your face. I also got Maybelline Liquid Define Liner in Black. This is MAGIC for me! I'm so rubbish at doing really nice flicks when I do my eyeliner and this makes it super easy. The end looks like a felt tip and it is firm so you can swipe it on with no mistakes. Annnddd that's it! FOTD coming soon and I'm also having a blog sale! Hit me up with a comment!